The e-commerce stock was hit hard last month but has bounced back in November. Shares of Baozun (NASDAQ:BZUN) slipped 18.1% in October, according to data provided by S&P Global Market Intelligence. There doesn't appear to have been any company-specific news behind the Chinese e-commerce company's stock sell-off, but economic concerns and the broader market's sell-off pulled shares to a six-month low. Chinese tech stocks have struggled in 2018 amid signs that the country's economic growth might be cooling and concerns about U.S. trade relations. Baozun's shares have rebounded in November thanks to an improved outlook for a trade deal between China and the U.S., but the stock is still down roughly 33% from its high earlier this summer. For long-term investors who are interested in China's e-commerce market and willing to wade into a volatile sector, Baozun's recent sell-offs could present an opportunity. Baozun provides an e-commerce platform for major Western brands, allowing them to create customizable online retail sites that are tailored to the Chinese market, along with marketing and customer management services. The company also provides warehousing and order fulfillment, though it's gradually moving away from that in favor of being a lighter, higher-margin business that's more directed toward software as a service. A slowdown for the Chinese economy can be expected to hurt Baozun's performance. However, the company's status as an intermediary for Western brands looking to tap into China's massive online retail industry doesn't expose it to as much trade-war risk as might initially be expected. The company includes Starbucks, Calvin Klein, and Nike among its list of more than 160 corporate partners. And the types of goods sold through its online portals probably won't be dramatically affected by the types of tariffs that have been levied so far. With China's online retail market growing 32% in 2017 to account for roughly half of the world's $2.3 trillion in e-commerce spending, there's still a big opportunity for Western brands in the country. 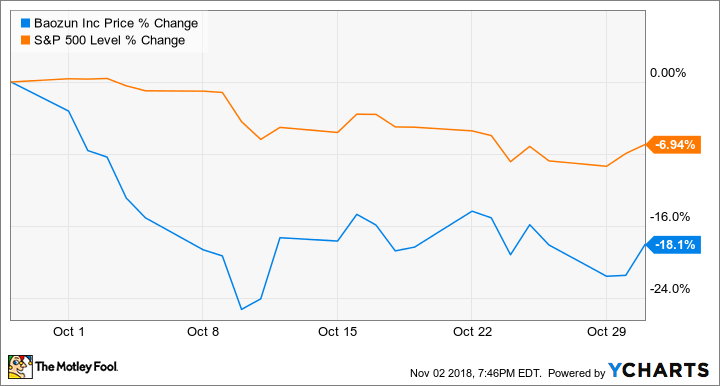 Baozun stock has bounced back with the broader market in November and has benefited from an improved outlook for a trade deal between the U.S. and China. Shares are up roughly 13.4% in the month so far. BZUN Price data by YCharts. Shares popped on Nov. 1 following comments from President Trump stating that a lot of progress had been made on trade issues, and that he expects to have a deal in the not-too-distant future. Investors will get a more specific look at Baozun's performance and outlook when the company reports third-quarter results later this month. It is expected to report earnings on Nov. 20 and is guiding for sales between 1.09 billion and 1.12 billion yuan ($157.4 million and $161.8 million), representing 18% year-over-year growth at the midpoint.